Jet Airways today appealed to India’s Largest Bank State Bank of India to release Rs 1,500 crore emergency fund as part of a debt-restructuring plan, and stop the airline from going bankrupt. A body representing pilots of Jet Airways on Monday urged Prime Minister Narendra Modi to save jobs at the airline requested State Bank of India to infuse the cash strapped carrier with Rs 1,500 crore as part of a rescue deal that was agreed upon last month, PTI reported. Jet Airways is a Debt Trap & Naresh Goyal is the king pin of that trap. Because #banks are already so deep into it, it’s in their interest to keep the airline running. It’s their best chance to recover investments. They keep pumping money with the hope that some day fuel prices will drop and Jet will make money! “We would like to appeal State Bank of India to release Rs 1,500 crore funds for the airline to help it continue operations,” National Aviator’s Guild Vice-President Adim Valiani told reporters in Mumbai. “We also appeal Prime Minister Narendra Modi to save 20,000 odd jobs at the airline.” Though the government had promised to intervene, “we have not seen the money yet”, ANI quoted Valiani as saying. The debt-ridden airline is operating only six to seven planes at this moment. Its entire aircraft has been discontinued after it defaulted on payments to banks, pilots and suppliers. According to Hindustan Times, Jet Airways has suspended operations to South and Southeast Asia and extended the suspension of services to Toronto and Paris from Chennai and back. Here are Jet’s #revenue numbers I pulled from #Wikipedia. 2 profitable years since 2010. Dig deeper & you’ll find that before 2016 it made a #profit way back in FY 2006-07 (27.9 Cr). The profit in 2016 & 2017 was primarily attributed to lower #fuel prices. Jet also sold 24% equity to Etihad airways around the same time, which they are now happy to sell at a 75% discount! 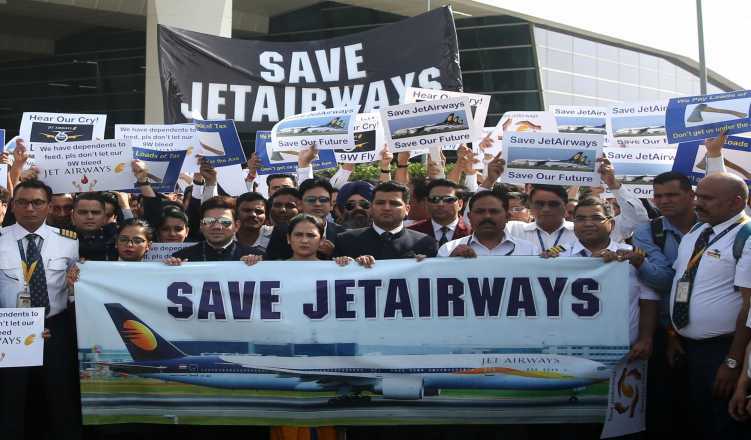 In March, Jet Airways founder Naresh Goyal and his wife Anita Goyal resigned from the board of directors of the company, which had said that an interim panel would be set up to handle its current ongoing crisis and affairs. It is about time the grief and agony for the employees is over, now they can move on with their lives. I’m perplexed at the effort that is going into saving Jet Airways. Some companies are run to accumulate losses & then be sold to a larger profitable enterprise. Sometimes it works, this time it failed. Why should an airline like this be saved using tax payer money? Why should an airline like this be continuously funded by banks? PNB & SBI – heard those names before? They are involved with Jet too. Who is taking decisions as these banks? Who is accountable? Does Jet have enough assets to repay this debt? Is Naresh Goyal accountable? Does it makes sense to continue running the #airline?